Finally my Bulgarian course was starting today. I was eager to get started and after a few days wandering around Sofia was glad to get some routine into the days. At least, after much exploring, I had finally managed to find the 'Spartak' olympic swimming pool where they don't like turning the lights on, the lifeguards read newspapers with naked women on the back pages and the hot water in the shower room is shared out between all the showers. There was one big shower room and if there were lots of people in the shower the water would only be luke warm for everyone, but if there was only one person in the showers you'd have to turn a couple of the other showers on because the water would be too hot. I discovered this feature the hard way after my first swim in the semi-darkness. A Bulgarian man was letting the water run on his back, looking shattered after his swim, when I, in blissful ignorance, turned my shower off without warning him and immediately sent a rush of extra hot water pouring down on him making him leap up in the air shouting something about his mother that I couldn't quite catch. 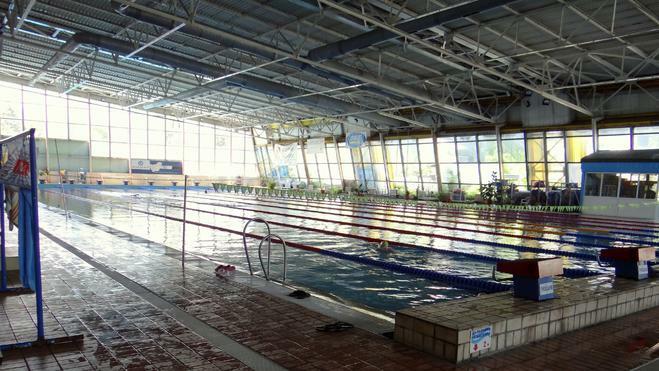 Spartak swimming complex looked like a grey industrial factory building from the outside. It was situated on the corner of a park and right at the end of the line for Tram number 6. Tram number 6 was an adventure initself. It was a bright orange tram with 2 big circular headlights on the front making it look like one of the characters from Thomas the Tank engine. I always wondered whether they ever cut anyone in half because they always shut closed with almighty slam and with no warning. There was no polite voice over the intercom saying 'Please stand clear of the doors'....the driver just slammed them shut when he (or she, as there were a lot of women tram drivers) was ready to go and that was that. 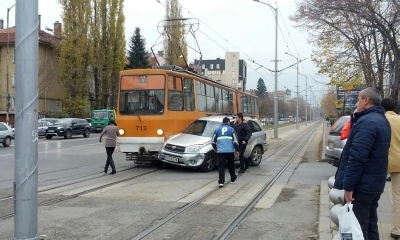 I also found out incidentally that the word for 'Tram Driver' in Bulgarian is 'Ватман' (Vatman) reminding me of a very different profession back home. So Spartak swimming pool showers and tram number 6 negotiated I showed up at the classroom at 13:30 and met my new classmates and teacher. There were 3 Turkish girls called Embiye, Leila and Sultan along with 2 Turkish boys called Shenol and Barish. There was a lot of Turkish students studying Bulgarian. Many of them had Bulgarian family. If they wanted to study in Sofia University they first had to complete the same Bulgarian language course that I was on. One of them also told me that it was a way for the boys avoiding military service in Turkey which was still compulsory at the time. There was also a Russian girl called Maria who had a Bulgarian husband. Maria was small, pretty and spoke quite good English. There was a Syrian boy called Faraz who seemed to speak some Bulgarian already and a Syrian girl called Ameni, also with a Bulgarian husband. Last but not least there was a a plump boy called Milanos from Cyprus. Milanos never really seemed to know what was going on and was very funny without realising it. He was always looking neat and tidy with his rucksack on his back and always gave you a big smile whatever you said to him. Even if you asked him where the toilet was Milanos would just nod and flash you a big smile. The teacher wrote her name 'Valentina' on the board but said we could call her 'Vale'. Vale was about 55, short, quite stocky, rimmed spectacles, had a voice like a guard dog and a very loud laugh. She spoke only in Bulgarian but now and again would say an English word that she knew. The classroom was small, just about fitting 10 of us plus the teacher in. Again, it was painted green to about shoulder height and then white. This seemed a very popular scheme in just about any building you went into, Apparently the paint that was used up to shoulder height was easier to rub down and clean. We got our new textbook and cracked on with the alphabet and saying 'Това е маса', 'Tова е стол' (This is a table, this is a chair). Each day we had 6 lessons of 45 minutes each meaning 4 and a half hours of solid classes each day. We covered a lot on that first day and it was a lot to take in. I knew I'd have to do a lot of studying just to keep up with the pace. Tomorrow I'd go and try and find a library.